Obituary for Lucile Coleman | House of Wheat Funeral Home, Inc.
COLEMAN, Lucile, age 96, of Dayton, born September 18, 1922 in Berea, Kentucky to the late Wendell and Estella Farris, departed this life January 15, 2019. Lucile accepted Christ at an early age and was a member of the Farris Town Baptist Church, before moving to Dayton where she joined Mt. Enon Baptist Church. She retired from the Federal Government in 1985 in San Diego, California. Lucile was an award-winning bridge player. She was a daughter in the Eastern Star and traveled many places such as Europe and all throughout the United States. Lucile loved music and loved to dance. We know she is dancing in Heaven now. She will always be remembered, by her family and many friends, as a kind, gentle and loving person, who cared for many in her life. 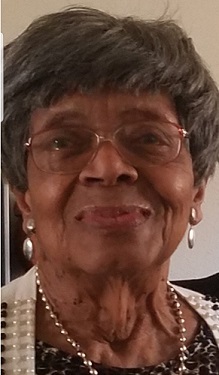 Preceded in death by her daughter, Nannie Martin; daughter-in-law, Earline Jenkins; sisters, Geneva White, Dorothy Dunson, Sadie Underwood; brothers, Lawrence, Charles, Clarence, Carl, Roy, Alford and Elmer Farris. She leaves to cherish her memory her sons, Louis Jenkins, Donald Jenkins, both of Dayton; daughter, Vanessa (David) Jackson of Los Angeles, CA; sister, Elizabeth Dunson of Berea, KY; grandchildren, Brandon and Byron Jackson, Louis and Angela Jenkins, Debra (Randy) Lynch, Tina (Alvin) Hall, Dawne, Panya, Maisha and Shye Jenkins, Felicia Heard; a host of other relatives and friends. Funeral service will be held 1 pm Monday, January 28, 2019 at the House of Wheat Funeral Home, Inc., 2107 N. Gettysburg Ave. Visitation 10 am at the funeral home until time of service. Family will receive friends one hour prior to service. Interment West Memory Gardens.